#stampinup #onstage2016 Today I'm sharing another NEW product from the NEW 2016-2017 Stampin' Up catalog. It's based on a card shown on one of the inspiration boards at the OnStage Live event. This card uses the totes adorbs host set "Pun Intended." This set is super cute--and the only way to get it is to host a stamping event. Contact me today to schedule YOUR event--and then you'll be able to get this set (with a qualifying workshop order)! 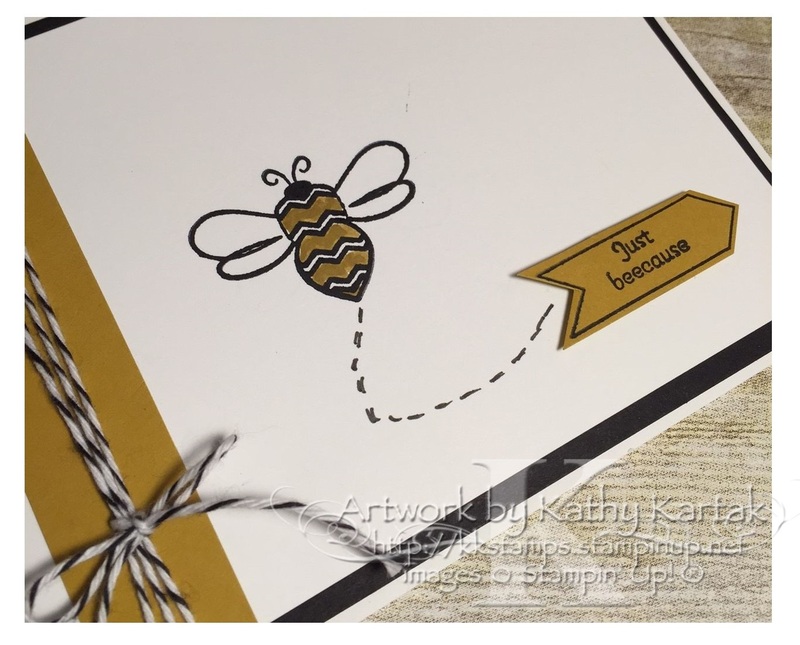 I stamped the bee in Basic Black Archival Ink onto a Whisper White mat. 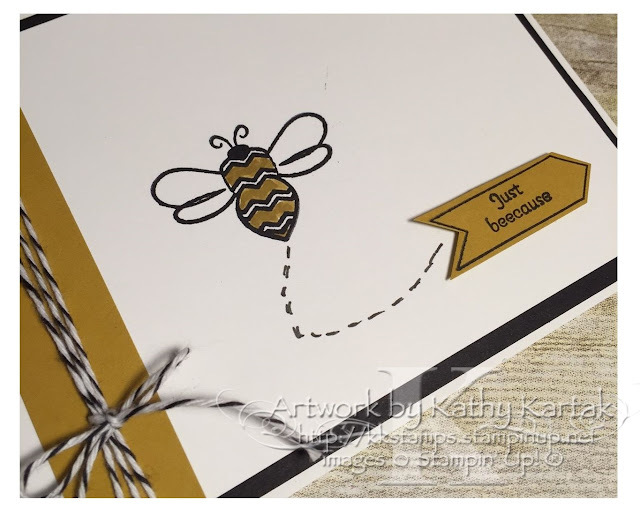 I colored the bee with a Delightful Dijon Stampin' Write Marker. I also stamped the arrow outline and "just beecause" stamps from the "Pun Intended" set in Basic Black Archival Ink onto a Delightful Dijon scrap. I fussy cut the arrow with my Paper Snips and adhered it to the card with a couple of Stampin' Dimensionals. I drew a hashed line from the bee to the sentiment using a Project Life Journaling Pen. I added a 1/2" strip of Delightful Dijon card stock to the mat and then wrapped it with Basic Black Baker's Twine. I tied a bow at the bottom. I adhered the Whisper White panel to a Basic Black mat, and then used Stampin' Dimensionals to add the assembly to a Whisper White Thick Card Stock card base. Simple! And so stinkin' cute!! Here's a closer detail of the card so you can see how cute the sentiment is--and the bee is totally adorbs, too. Stay tuned, because later this week I'm going to show you another card from this fabulous host set!